In support of dairy and small family farms, Clover Sonoma doubles-down on efforts to educate consumers on the irreplaceable nutrition of dairy as a natural-occurring superfood. 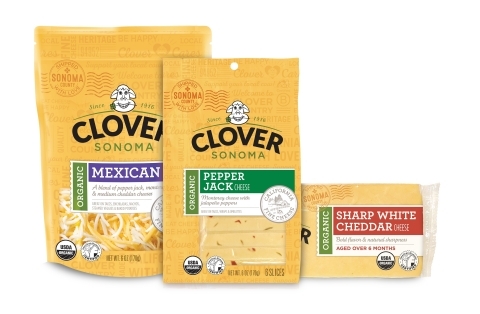 ANAHEIM, Calif.--(BUSINESS WIRE)--NATURAL PRODUCTS EXPO -- Clover Sonoma, a third-generation family-owned and operated dairy, today announced its 2019 new product lineup at Natural Products Expo West (NPE West). Just in time for the company’s beloved mascot Clo the Cow’s 50th birthday, the company introduces new organic omega-3+ milks, flavored butter spreads, and organic cheeses, along with expanded offerings in its current product line. With a growing category of plant-based alternatives on the market, Clover Sonoma aims to educate consumers about the irreplaceable, naturally occurring nutrition that dairy provides as a vitamin source and superfood. 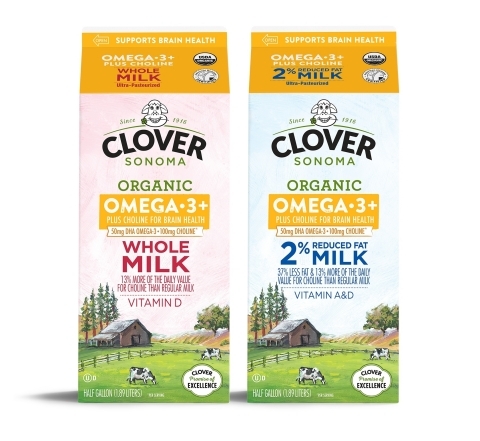 Clover Sonoma’s new organic omega-3+ milks are a nutrient powerhouse, providing the naturally occurring vitamins, minerals, and protein in milk itself, plus 50mg of DHA omega-3 and 100mg of choline. Both DHA omega-3 and choline are important nutrients because our bodies cannot make them, so we need to get them from our diet. One serving of organic omega-3+ milk will provide 25% of the recommended daily value of DHA omega-3, and 18% of choline. According to experts, omega-3 significantly improves children’s reading skills, and choline is vital to children’s cognitive development and memory function. Cows are not treated with the growth hormone rBST. Farms adhere to the high standards of USDA Organic and Non-GMO Project certifications. Cows are cared for under American Humane Certified animal welfare standards. Daily and weekly testing of milk ensures low bacteria counts, 3–6x lower than state and federal standards. Farms strive to make annual environmental improvements to their land. 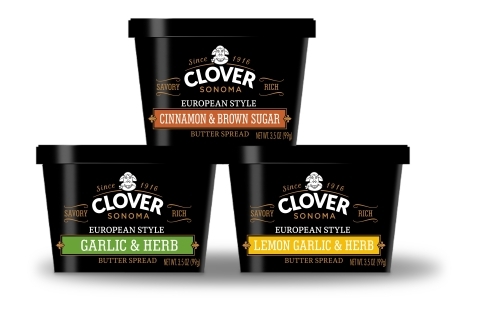 Aligned with the recent trend of flavored butters popping up in restaurants and meal kits across the U.S., Clover Sonoma is launching new 3.5 oz flavored butter spreads in both savory and sweet varieties. Made with sweet cream butter and handpicked spices, each flavor is sure to delight even the most discerning culinary artist. Each small batch is slow blended to achieve its rich and creamy taste, making them great options for turning up toast, drizzling over popcorn, or giving a new flavor profile to tried and true recipes. Made with AHA certified organic milk from Northern California family owned dairy farms, Clover Sonoma’s new organic cheese line is a rich reflection of what happens when the best ingredients meet the most conscious dairy practices. Our expert cheesemakers blend the finest organic milk with carefully selected organic ingredients to deliver unmistakable flavor in every meltworthy bite of cheese. Earlier this year, Clover Sonoma expanded its popular cream on top organic yogurt offering to include a value-sized 24 oz. option in plain and vanilla flavors, and later in 2019 the company’s top-selling organic pasture raised eggs will be available in a six-count package. Additionally, Clover Sonoma organic cream cheeses will include a new spreadable cream cheese SKU. Research shows that there is no one to one plant-based alternative for milk, which is partially because there is no standard of identity for non-dairy milks, making direct comparisons challenging even for a nutrition professional. Dellolacono’s analysis shows that with a simple and short ingredient list, milk provides high quality protein identified to support healthy muscles and maintain lean body mass. It also provides several important vitamins and minerals that are not naturally present in non-dairy alternatives like calcium, vitamin D, vitamin A, phosphorus, potassium, B12, riboflavin, zinc, and magnesium. To replace the nutrients found in one cup of milk, one would need to consume 1.5 cups of spinach, 4 oz. of pork, 1 large tomato, 3 oz. of beef, 1 egg, 3/4 cup of ricotta cheese, 5 sardines, 1 oz. of almonds, 4 oz. of chicken, and 1 cup of quinoa. Naturally occurring nutrients in dairy milk are also better absorbed by the body than added vitamins and minerals. For those with a dairy intolerance, complete avoidance is often not necessary. Lactose free milk contains all the benefits of milk without the lactose. Sometimes just reducing the amount of dairy consumed without completely cutting it out will relieve symptoms of lactose intolerance. NPE West attendees can visit Clover Sonoma at booth #2205, or Fresh Ideas booth F98, to learn more about all the delicious dairy products the family offers. Third-generation family owned and operated, Clover Sonoma is recognized as a leader at the forefront of the dairy industry. The Petaluma-based company in Northern California’s beautiful Sonoma County was the first dairy in the United States to become American Humane Certified, and hold its partnership of family-owned dairy farms to a higher standard by developing its own unique Clover Promise of Excellence. Clover Sonoma is proud to bring conscious dairy products direct from its farms to consumers. Now a Certified B Corporation®, the company uses its business as a power to do good, and its passionate support of animal welfare, sustainable business practices, and local community have always been hallmarks of the business. Each year the company gives back at least five percent of its profits to support these passions under its Clover Cares program. For more information, please visit www.cloversonoma.com and join the conversation on Facebook, Instagram, Twitter, Pinterest and YouTube.